It has been randomly around five years that Renault showcased its R-Space Concept. 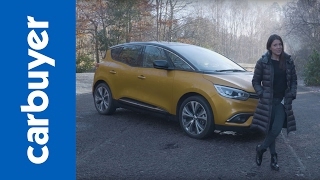 Today after around this half a decade they finally took the curtains off the production version of the concept named Renault Scenic 2017. The model comes with great exterior and some features that will undoubtedly steal your heart. 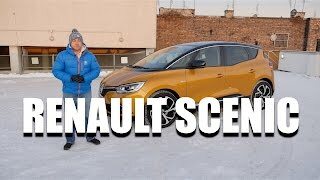 Let us have a look at the review of Renault Scenic 2017 to know in detail about it. The interior of Renault Scenic 2017 is an impeccable amalgamation of class and spaciousness. Starting with the clean and well arranged dashboard, we have center stack that comes with a shifter below it. The center console finds its place behind it, giving easy access to all the passengers and driver. Seating resembles to the one we saw in the concept featuring high-end trims with massaging, heating and eight-way electric adjustment with lumbar support while the rear seats come with auto folding feature getting operated through the One Touch Folding system. Talking about technology, model is equipped with an 8.7 inch center stack that has R-LINK 2 portrait-format display. 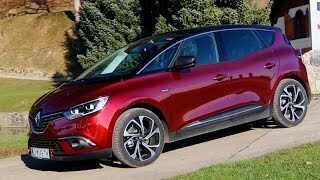 Thus rounding up the interior details of Renault Scenic 2017 I would call it spacious and luxurious. 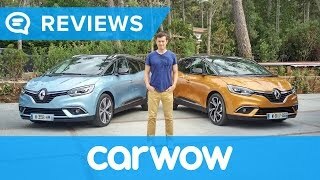 The exterior of Renault Scenic 2017 gets a lap ahead of its predecessor in terms of style. The grille gets a wider shape towards the bottom where the multiple horizontal louvers further accompany it. On the either corner, we have the LED headlights designed in shape of eyelid featuring the Pure Vision Technology. Moving towards the sides, the model gets a bit different from the concept version. Here you can notice a huge glass panel between the windshield and door while the mild body lines add to the looks. At the rear corner things get really attractive with the wraparound taillights and the chrome handle. Thus rounding up the exterior details of Renault Scenic 2017 I would call the model a perfect amalgamation of design and technology. Powering the Renault Scenic 2017 are total eight engine options including, six diesel engines and two petrol engines. As the base powertrain we have a 95 hp diesel engine paired to six-speed manual transmission. The 110 hp diesel comes in three variations including a hybrid assist, a dual clutch attached and one with a seven-speed automatic transmission. The last two for the diesel engines include a 130 hp and a 160 hp paired o six-speed manual and six-speed dual clutch automatic respectively. For the gasoline powertrains we have 115 hp and 130 hp mating to six-speed manual gearbox. The performance figures of Renault Scenic 2017 are still not revealed but we assure to share them as soon as they’ll be out.